It's beginning to look a lot like Christmas in the Bolton household Yours, too? Our Christmas tree is glowing in the lounge and most of the decorations are up, but I just need to put a few finishing touches here and there. 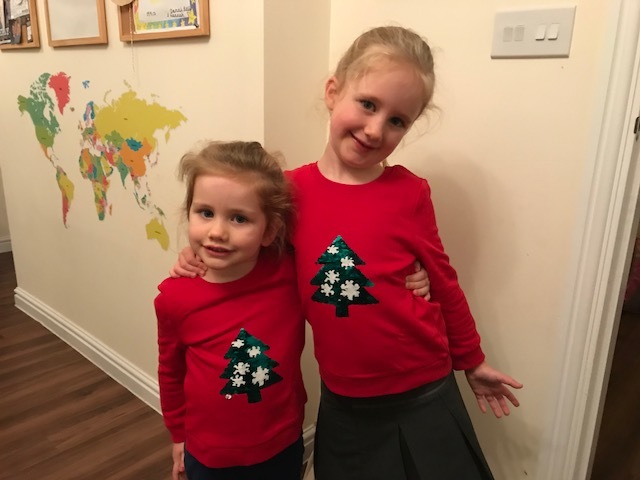 The girls even got to proudly don their new apparel at school on Friday. Hiding away in various closets and boxes around the house are presents patiently waiting their unveiling Christmas morning. "Lauren", you may be wondering, "how do you find pennies at Christmas? Do you really follow a budget at Christmas? But it's Christmas! It's the time of year for giving and abundance!" Well, yes it is a time for being generous and perhaps abundance, but I definitely believe this can be attained by following a budget and making the most of your precious pennies. "But how Lauren, HOW?" *she imagines this being questioned in a dramatic tone* I'll tell you how. 1. Set realistic expectations: There are so many pressures to have a "perfect" Christmas, but let's face it, your house is mostly like not on the cover of House Beautiful, nor are your children the models for a beautiful children's clothing brand or all of your gifts going to be purchased from Harrods. *sigh* Be honest with yourself and ask what the most important thing about Christmas Day is: is it the presentation of gifts under the Christmas tree? Giving that perfect gift to a loved-one? Perhaps it's the all-day-long buffet of beautifully tasting food and drink. Maybe it's that atmosphere of a decorated house, lovely scents of cinnamon, cloves and orange, Christmassy music and fantastic company. Maybe you want to choose one or two things that really matter and set your attention on those things and not the others. Believe me, I want to make sure my family has a wonderful Christmas, but I also want to do this in line with my Christmas budget. 2. Set a Christmas budget: Perhaps I'm a little too late in posting this tip as you may have already started or even completed your Christmas present buying, but this is critical. If you spend your money willy nilly to buy presents, Christmas cards, party food, celebratory meals out and whatever else, how much does this add up to? More importantly, are you able to pay for this in cash or pay it off immediately with your next credit card bill... or are you paying it off for months afterward? I hope the former. None of these things are wrong or too lavish, but by planning for Christmas before you spend anything is so important to staying on track. I do this by having a Christmas tracker as part of my budget and planning for the usual expenditures: gifts for my children, gifts for my husband and extended family, and Christmas cards and postage (which adds up quickly for us, since we order 125 Christmas cards!). I do not include food in my budget because I'll just fit this in with our normal food budget, and I plan to use some Nectar points at Sainsbury's to pay for extra treats. I also don't have any special meals out in our budget, simply because we don't have any special plans. But if we did, I would include this in our Christmas budget. I don't plan on buying any new Christmas decorations or - my downfall - Yankee candles. I have some from last year which hopefully see me through the season. Our Christmas budget was actually set before 2017 even began. When setting up our 2017 budget 31st December, I divided this number by 12 (months) and we save that amount each month for Christmas. Yep, we save all year for Christmas. No special savings plans that you see advertised on tv, just money set aside in our checking account. Since I keep my budget on a spreadsheet, it's easy for me to keep track of expenditures and how much I have left to spend on Christmas. 3. Stick to your Christmas budget: Believe me, I am tempted to buy each and every time I set foot in a shop... hey, those marketing professionals know what they're doing! If you find it difficult to walk out of a shop without buying something, limit how often you step inside one. The more often you make trips to the shops, the more likely you're to spend extra. Buy more online! The advantage of doing this is, not only am I not tempted by things that I didn't intend to buy in the first place, but I usually find discount codes for anything from free shipping to 25% off the purchase. Another trick I've been using is using discounted gift cards I've bought online to make in-store purchases. What?! You've never heard of buying discounted gift cards? There are a few websites you can do this through, but I've been using Zeek for the past year and have saved quite a bit! I wrote a post on this in January but in short, with Zeek you can get gift cards for the normal places you shop at a discount, plus if you follow the link above, you'll get £3 off your first purchase. Once you set up an account and share Zeek with others, you get a credit to spend on your next purchase as well. I've already mentioned using my Nectar points from shopping trips to Sainsbury's - although these are becoming fewer and far between as I'm loving Aldi and a local meat delivery service (#ukfreshmeats) which offers great value for money. In November, I took advantage of the Nectar double up promotion where by points were exchanged for vouchers worth double the usual amount. I spent these vouchers on a couple of DVDs for the girls' stockings, a silly gift for my husband and a My Little Pony costume for Brenna. These things I don't count against my budget as the points were pretty much free to begin with - yes, I had to spend money to get these points - but I didn't need to spend anything to buy these things. Although most, if not all, of the presents for our girls have already been purchased, the gifts for my in-laws (parents, brother and sister) haven't yet been purchased. However, I've already accounted for these costs on my budget so I don't go over. 5. Remember the true reason for the season: As a believer and follower of Jesus Christ, I keep the whole Christmas season in perspective. He is the reason Christmas is celebrated. Jesus - the King of Kings, the Lord of Lords, the Prince of Peace - was born among animals in Bethlehem - a lowly birth for a king! Yes, there are many, many things at Christmas that are fictional and come from pagan beginnings, but remembering that my Lord was incarnated as Jesus Christ, a perfect human, to a sinful world to later die to save His people from eternal punishment makes everything else dull in comparison to this amazing fact. No light is brighter and no gift is more precious than my salvation through Jesus Christ. I wish you an amazing Christmas season full of joy and blessings. "Beans and Rice, Rice and Beans"
Welcome and "Forget the Budget!"